Jade and are Martin originally from Australia but after being offered a very good position in Amsterdam, they moved to the Netherlands for a few years. As they love everything French (food, wines, chateaux…), they chose the Chateau de Varennes for a long week-end with their closest friends and family. Jade sourced many props herself including vintage tennis rackets as a tribute to Martin’s hobby. She asked us to re-create a shabby chic tea salon with lace and vintage crockery. 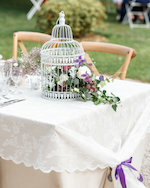 We also we included bird cages on the tables as a nod to their pet parrot.